Hello! And welcome to the 3rd episode of the Good Karma interview series. This episode is special - not only because of our very special guest [Tarun], but also because I was able to record the audio of the interview. The interview is just over an hour. So, if you don't have an hour right now, skim over the interview notes below, bookmark this page and come back and listen to it. You'll learn so much from Tarun - about following your heart and being courageous and honest with yourself. Tarun’s travels started early. His dad’s work required the family keep moving from city to city every year or so. That meant far fewer long term friends from school. But the flipside was the exposure to different people, languages and cultures. It was fun and quite enjoyable. His dad would practice yoga at home and Tarun would join in, once in a while. No serious business, just having fun with the asanas. Perhaps that also made him more flexible. As he and his brothers got older, they moved to Hyderabad and settled down. Tarun enrolled along with his dad. And thus started his first regular yoga sessions. Being the flexible youth he was, he had a good time. He was a bit of a star in the group - and didn’t miss the opportunity to show off difficult asanas, whenever he got the chance :). A couple of years rolled by, and after a brief hiatus, it was time for college. He couldn’t practice with the group in the park anymore, but yoga followed him into college. He was trying out a bunch of different sports in college - not really sticking on with anything. That was when news about an inter-college yoga competition happening in the city got his attention. He enrolled, trained a bit with others on the team - and went on to win medals for his college. He observed others pushing themselves beyond their limits and getting injured in the process. Not very different from what you’d expect from a gymnast. Tarun didn’t like the vibes and felt a disconnect between yoga and competitions. He didn't feel the ‘spirit’ of yoga in that environment. What after college? Do a masters and go abroad for work, of course. That’s what everyone else was doing. So, that’s what Tarun did as well. Almost. While Tarun still kept his option of doing a masters open, the urge to learn more about yoga had grown through the college days. And the break after college was the perfect opportunity to do exactly that. The day long classes and sessions stretched from 5AM - 8PM everyday. The focus of the lessons was mostly the philosophical aspects of the practice. For example, lessons from The Bhagavad Gita were given a lot of importance. While the classes were nice, Tarun real takeaway was the community of people he met and befriended during those 30 days. For the first time, he saw so many people - young and old - with one thing in common: open mindedness and empathy. A crowd that was receptive of new ideas and weren’t judgemental. The atmosphere was a refreshing change from what he’d experienced so far. Of course, everyone was also serious about yoga. I went into the course concerned about other people’s opinions....their opinions of me as a person and my choices. Once Tarun was back home, one thing led to another. The plan to pursue his masters was parked temporarily and replaced by the dream of teaching yoga professionally. He would at least give it a shot, and if things didn’t work out, there was always plan B - the masters program. Soon he found himself along with his buddy at Bharat Thakur’s Artistic Yoga [BTAY] yoga center in Bangalore. Not to practice, of course. But to teach. There was a 6 month training program that was a deep dive into yoga practice and teaching - just what Tarun was looking forward to, to kickstart his teaching career. The course at BTAY was much more physically intense, and there was a constant mix of teaching, observing others teaching, practicing and theory classes. As Tarun started taking more classes, he found good reception from students. This was a huge boost to his confidence. Steady income had also started to roll in. The idea that this could be a permanent shift for Tarun became apparent to everyone at home. Did he face any resistance from family? Were they concerned about him taking an off-beaten path? Yes, they were concerned. But I just told them to wait. To give me a bit more time. So they did. It took about 3 to 4 years before his family and friends was able to completely accept the fact that yoga was his future. And to stop suggesting alternate choices. Curiosity about the yoga world outside, got the better of Tarun after the first year or so at BTAY. So he quit and traveled to Mysore to learn Ashtanga Vinyasa. With some more training under his belt, he returned and once again resumed teaching. This time he was looking for more exposure - and that’s what he got. He also trained and taught at a1000Yoga at Bangalore - where he met other senior teachers from diverse backgrounds: Traditional Hatha Yoga, Iyengar yoga, Ashtanga - a nice mix of various styles that he could learn and experiment with. Over time he personally preferred the more traditional Hatha Yoga style of practice. He found it much more customizable and easier to adapt to the student’s needs. If you’ve listened to the audio already [If you haven’t, here's the link again. ], you already know that Tarun has a stammer. Going back to those days of yoga in the park, I had a really good time there mostly because I could finally express myself in ways that others couldn’t. The connection between his stammer and yoga doesn’t end there though. 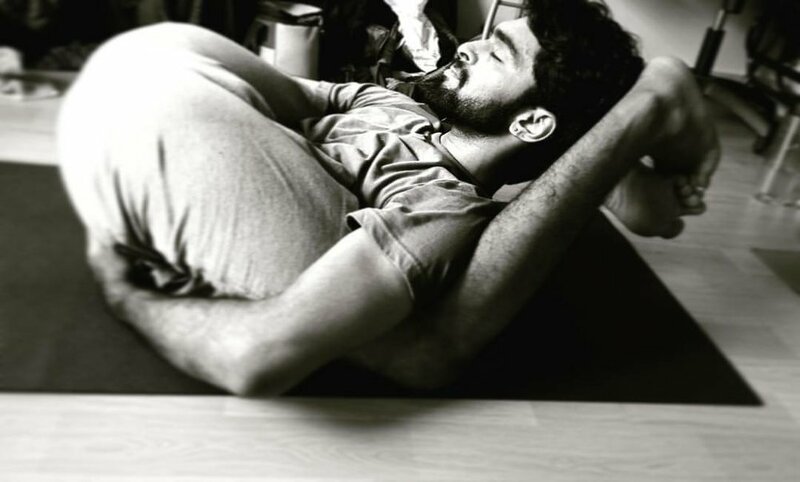 Why did he catch a train to learn yoga the very day after his exams? While yoga was always close to his heart, it was also with the hope that yoga could get his stammer cured. Why did he desire to get deeper into yoga and pursue a career in teaching? To share yoga with his students and help them grow, of course. But it was also with the intention of understanding [and perhaps curing] his stammer - with more intense practice and deeper analysis of his own mind and body. As you already know by now, he hasn't been able to cure his stammering yet. But if yoga hasn’t cured Tarun yet, what impact has it had on him? Yoga became his primary form of expression. As he’d discovered at SVYASA earlier, the yoga community was also where he first discovered friendly, warm, empathetic people that he could connect with. And his students? How open were they to learn from him? How much did his stammer get in the way of instructing them? I’ve been very lucky to have open-minded students. It’s been 8 years since he started teaching yoga. During this time, his teaching has evolved from being asana-and-physical-health-focused to helping his students become more comfortable with themselves, to create more space for themselves. “Space” is what Tarun got from the yoga community. And he is now paying this forward to his students. Stammering is what triggered Tarun's yoga journey. He'd expected to get cured and the get back to ‘normal life’. The magic of yoga works in unexpected ways. I'm sure Tarun would be pleased if his stammering stopped, but I came away from the interview feeling that it doesn't bother him much anymore. I think he's come to peace with it.